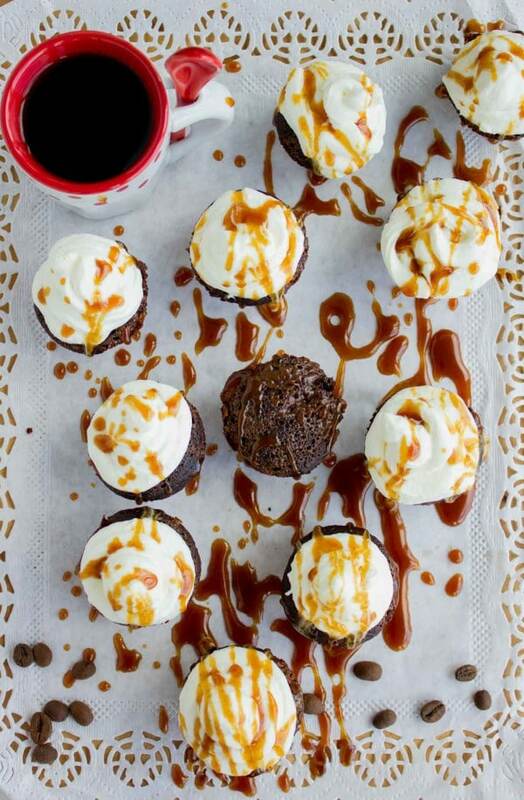 This chocolate caramel latte muffins recipe will make you never want to go back to any old chocolate muffin. It’s absolutely a dream come true for latte lovers, coffee lovers, chocoholics, caramel lovers and sinfully good treats lovers! Photos can’t do enough justice to these tiny little bites of coffee chocolate caramel goodness–only making them can! 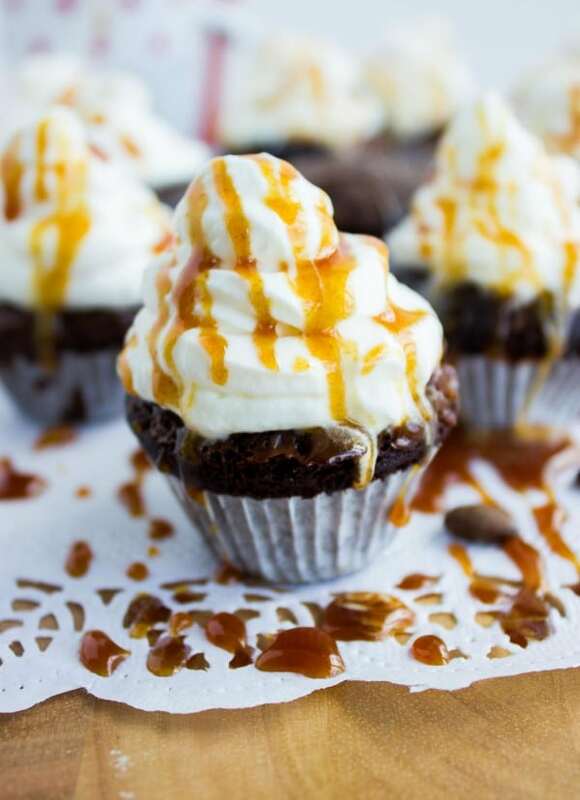 I am torn to get super excited about these adorable tiny sinfully delectable chocolate caramel latte muffins, because i i feel the photos are hideous given how out of this world good they are!! I have to admit, with both girls staying home now for a bit before summer activities begin, photography has been a challenge–and specially when chocolate is involved! And because those aren’t kid friendly by any means since they involve a good load of espresso–I made another batch of great chocolate mini muffins from this recipe I used in the mini Brooklyn blackout cakes–the girls couldn’t keep their hands off this latte version. I guess the whipped cream and caramel made it harder for me to tempt them with anything else. 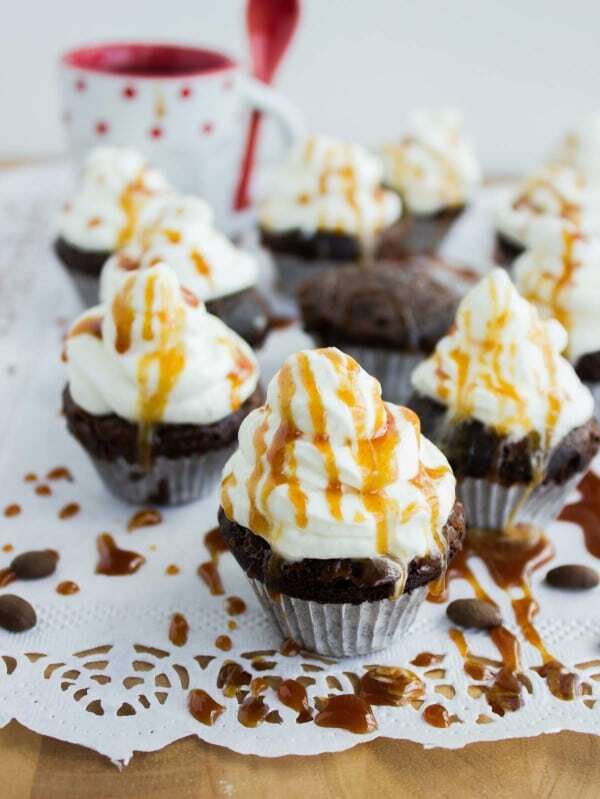 Ok aside from all that–I want you to take a minute, close your eyes and imagine biting into one of these chocolate caramel latte muffins now! 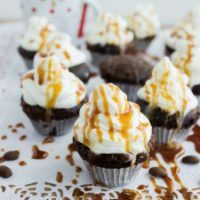 This is how it tastes–a dark chocolate cake spiked with freshly brewed espresso that’s stuffed with a little espresso chocolate ganache giving a melting chocolate espresso feel inside the muffins, topped with freshly whipped cream that’s not too sweet, drizzled with a vanilla caramel sauce to just add the perfect sweetness!! Yes indeed, it’s all of that. I love to think of this as my favorite latte and treat at the same time, and I still feel a nice cup of coffee is much needed to have with this treat for just an ultimate caffeine mood boost. Ok I have to admit, one of my closest friends would be scared reading this right now as she lacks any feelings towards caffeine, but I can’t even say I feel a bit guilty–this chocolate caramel latte muffin with a nice cup of coffee any time any day simply makes my day!! So a couple of things to get things easier for you when you make them, have your caramel sauce ready–my light homemade caramel sauce takes 5 minutes and keeps in my fridge for up to 3 months, so I almost always have it handy. When it comes to the whipped cream–use store bought if it’s your preference or take a minute and whip up fresh cream (recipe below). And while the word ganache sounds like a fancy French sauce, it has all the fancy of French but it’s made simply in the microwave with two (three in this case) ingredients for 40 seconds. 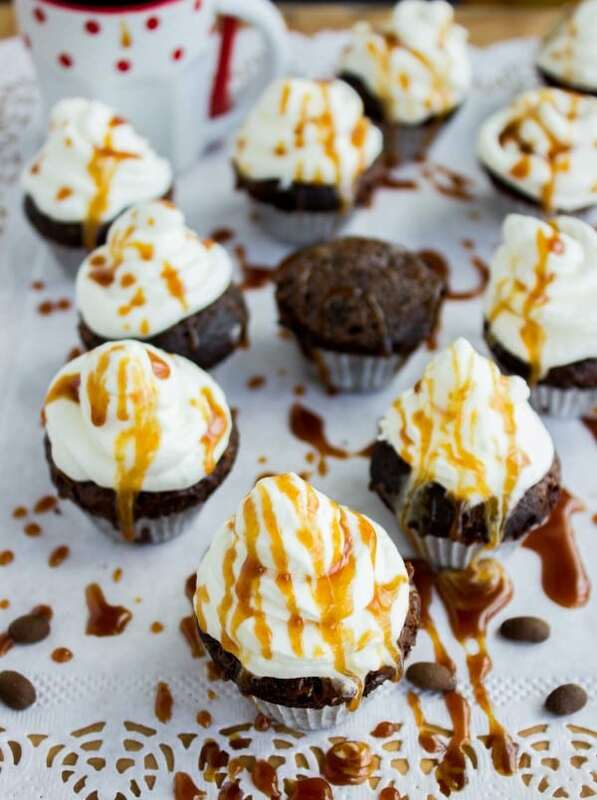 The ganache I use here in these chocolate caramel latte muffins is a mixture of tiny bit of cream, chocolate chips and a hint of freshly brewed espresso. Once I dollop a tiny teaspoon of this ganache in the center of each mini muffin, this ganache sinks in to nearly the bottom of the muffin and never hardens or acquires any muffin like texture–so it’s almost like a faint chocolate espresso sauce moistening and flavoring the muffins even more. 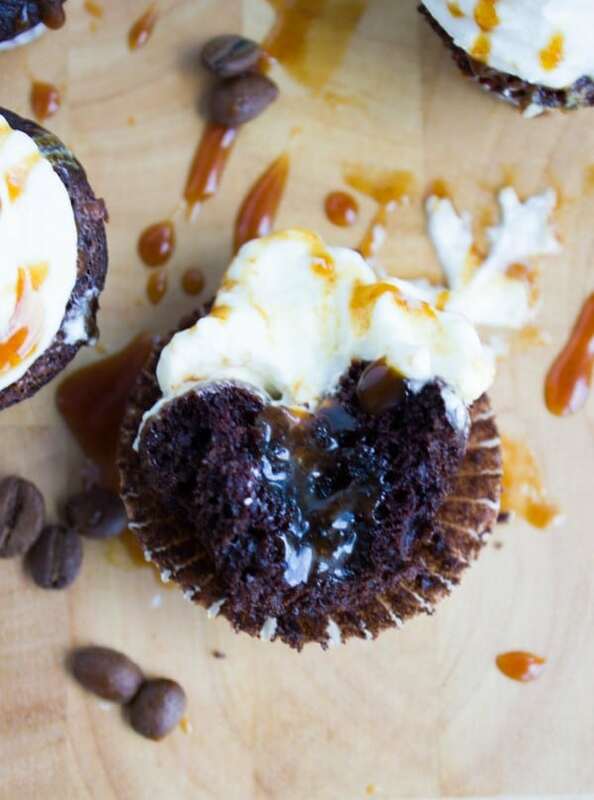 For the record this step can be skipped altogether and you’ll still have an awesome chocolate caramel latte muffin–but with the ganache it’s outstandingly awesome.. The muffin batter is as simple as ever using one bowl and everything whisked up, and because I make them in mini sizes, they bake for just 8 minutes. If you want to make them into standard muffin size just bake them for around 18 minutes. Place all the ganache ingredients in a bowl and microwave for 45 seconds. Take a whisk and whisk them until smooth and silky. Set aside to cool and harden a little bit. Line a mini muffin tin with paper cups (best way to avoid any sticking of the muffins or ganache to the pan). In a bowl microwave the chocolate chips, coco powder and freshly brewed espresso for 30 seconds. Use a whisk to smooth out the mixture. Add in the sugar, oil and egg and whisk well. 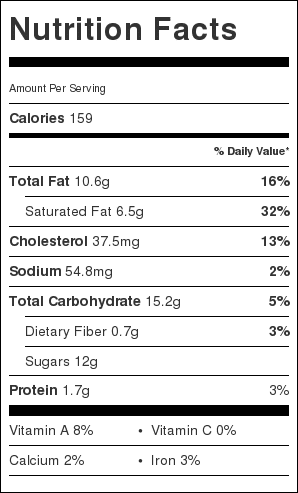 Add the flour, salt and baking soda and whisk everything together. Pour the muffin batter evenly between the 24 mini muffin tin. Take half a teaspoon of the ganache and place it in the center of each muffin batter pushing it in slightly with the spoon. Bake the muffins for 8 minutes until done. While muffins are baking, start whipping the cream. Place the cream, sugar and vanilla and whip at highest speed for 5 minutes until the cream is stiff. Chill the whipped cream in the fridge until ready to use. Cool the muffins at room temperature for abiut 15 minutes. Place the chilled whipped cream in a pastry bag with a fancy baking tip or just simply snip off a little piece at the bottom of the bag and pile the cream ontop of your muffins as high or low as you like. 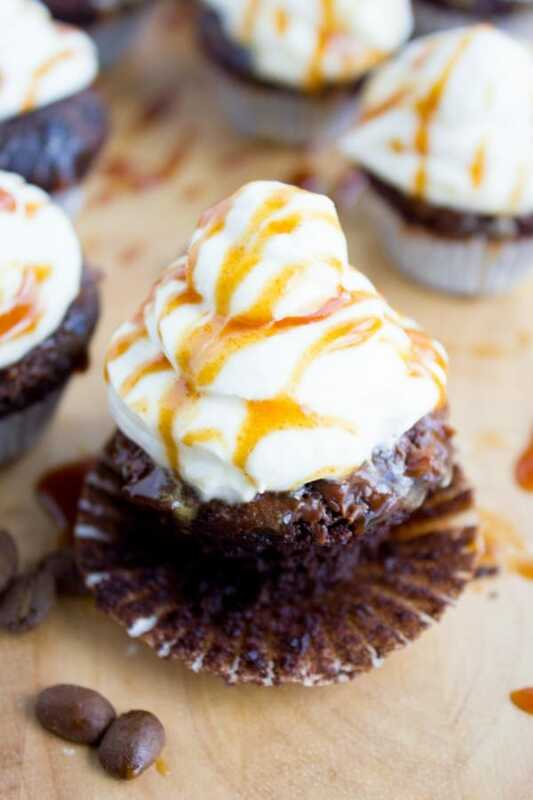 Drizzle the caramel sauce on top of the whipped cream-as much or little as you like.